Book titles are about as difficult as taglines. It's like someone asking you to describe your book in one word. I usually come up with the title after I finish writing. In the case of The Sciell's Legacy, I created a working title to talk about the story online and the name stuck. Most of the time, I'd try on a couple of names until one spoke to me. The Sciell started out as Feast but that name didn't fit. Is there an important location in your story? Supernatural horror novels are often named after places. That's how I came up with Devdan Manor, The Unburned Island and The Jura series. Or, you could pair the place name with another work like Lovecraft did for The Shadow Over Innsmouth. Have a key race or family in your novel? Each book in my Merging Worlds Series has Sciell in the title, named after a race of people the series surrounds. I've gone back and forth about removing Sciell from the title. Most tips say to use words reader can easily pronoun. Still thinking about that. 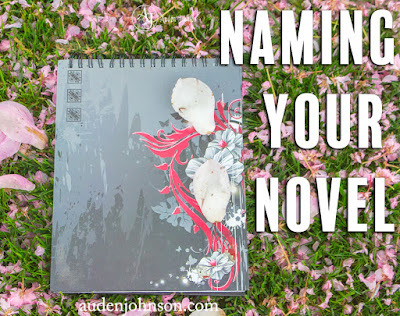 You could also name your books after a key character. Take the Harry Potter stories. The titles are just Hary Potter and the... One of my favorite stories is called Sabastian: Family of Lies. When I can't think of a name, I list all the themes in my book. Then I break open thesaurus.com and look up synonyms for all the words on my list. I'd start stringing words together until something clicked. Your title doesn't have to be super fancy to make an impact. One short story I wrote is about a character who got their wings stole. It's called Clipped Wings. Stephen King's book about people trapped in a dome is called Under the Dome. I think there's a name generator for anything. I've never used them to create a name for my book but they could be good inspiration. Like covers, book titles in certain genres have a pattern. For instance, if you put dragon in the title, more than likely, people will assume your books' fantasy. Look at other books in your genre and see if you spot any patterns. "The easiest way to ensure you have an original title is to type the phrase into an Internet search engine, or even Amazon.com. Some great titles will produce matches, of course—but if you are the first person to coin the phrase you’ve chosen, then you know you’ve hit the originality jackpot." "Great titles hint at the story to come. They point to the main conflict: What’s at stake? When a title can concisely encapsulate action, you’ve got a great shot at getting a reader’s attention in just a few words." How do you create titles for your stories?